Peti & Taller Are In Town! Mateo Amieva from the hit Las Vegas show “Criss Angel MINDFREAK!” by Cirque Du Soleil and Christian Ford aka the Bad-Boy of Magic from the Golden Globe-winning FOX Comedy, “Brooklyn Nine-Nine”! Peti & Taller Are In Town! 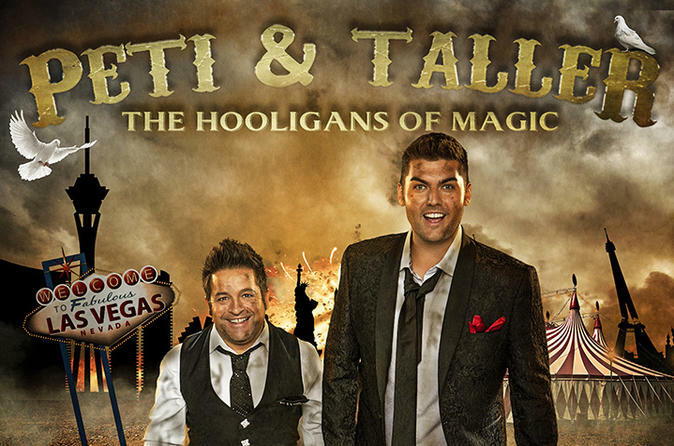 Make your way to the Hooters Casino Hotel on the Las Vegas Strip to see The Peti & Taller show. Join “The Hooligans of Magic” for an action-packed, laughter-filled evening of magic and mayhem where Mateo Amieva and Christian Ford prove that anything is possible in Sin City. Pre and Post Show you can enjoy the food, beverages and gaming at the World Famous Hooters Casino Hotel; which features the World's busiest Hooters Restaurant and the World's Largest Stake N Shake.